What IS this amazing fruit? It's none other than the common apple . An underrated gem! Particularly in an age of synthetic vitamins, alleged super-foods, side-effect laced 'wonder' drugs, and purported cure alls. I woke at sunrise. I did a good, tough calisthenic workout: 800 squats, push-ups, and crunches - along with sprints thrown in for good measure. I followed with a relaxing run to a local fruit market. There, I loaded my back pack with apples. Then I ran home. 'Twas a good a two-hour workout. Oh yes: And I live on the ninth floor of a condominium complex with a VERY steep set of stairs. Which I leaped with ease! The apple resembles a near-perfect food for Man. Which would be about 90% glucose (carbohydrates), 4 to 5% amino acids, 3 to 4% minerals, about 1% fatty acids, and 1% vitamins. The apple is RIGHT THERE in all of these categories. It provides everything you need for a vibrant, healthy life. The apple is low in calories. Yet it's full of fiber. Which keeps you feeling full and satisfied. You can eat a lot of apples - WITHOUT having to worry about 'counting calories.' When combined with vigorous daily exercise? The apple's low fat, and high fiber content makes for a lean athletic body, every time. The apple mixes well with mineral-rich greens - creating a TRUE super food. Today's fruit can be a bit low in vital minerals, compared to that of many years ago. This is due to over-farming and depleted soils. Sure, the apple is great on its own. Yet it's even better when combined into a smoothie or salad - with edible greens like spinach, bok-choy, or kale. All of which are loaded with essential minerals. Try a green smoothie. You'll get all the vitamins, minerals, amino acids, and essential fatty acids you need to maintain a SUPER healthy life. And keep up a rigorous workout schedule, too. 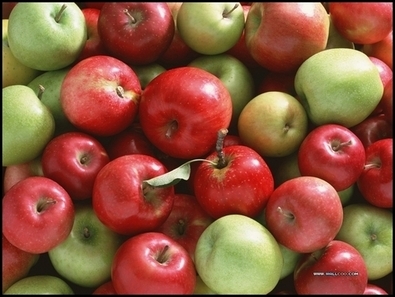 The apple's fiber gently scrubs your digestive tract, naturally discarding built-up toxins. Eat apples. Your energy will soar! When your body isn't forced to deal with an overloaded, toxic colon? You'll be pleasantly shocked at how your overall energy increases. Eat nothing but fruits and greens for a week. Your bathroom trips will become regular. You'll free up energy for more demanding workouts. You'll sleep well. And: You'll build a wonderful, cleansed feeling from deep within. One that you may not have enjoyed in years. Eat apples. And in all likelihood you'll reduce your risk of cancer. This makes you feel better (psychologically), to put it mildly. Research Director of the French National Institute for Health and Medical Research, Francis Raul, PhD. has shown the following: Rats exposed to cancer-causing substances develop pre-cancerous lesions when given water alone. Yet when when rats get water with apple juice? They develop HALF the amount of lesions. Now that's 'apple power.' Do studies like Raul's translate to human cases? I say emphatically, yes. Especially when you consider the case histories of Dr. Abramowski, Prof. A. Ehret, Dr. Ruth Heidrich, Dr. Lorraine Day, M.D., and others. All of whom have successfully treated 'terminal' cancer with a plant-based diet - and with a MASSIVE emphasis on fruit. Make apples a mainstay in your diet. You'll enjoy FAR more years of vibrant, healthy living. Plus: You'll feel great, in the bargain! Your body shall thank you. Copyright 2015, Jeff Sekerak. Consult your doctor before engaging in any diet or fitness plan. Consult your good old common sense too. Which, for my money: Rarely steers you astray.